Make the fangirls (and boys) in your life happy with these geeky holiday gifts! Get your friends to fly their fandom flag high and proud this Christmas by getting them these awesome fangeek items. Whatever fandom your pal belongs to, chances are you’ll find a sticker or patch from Fandom Feels that represent. From Riverdale to Stranger Things, DC's Justice League to Marvel's Avengers, and everything else in between, there’s something for every fanboy and fangirl. Dany and Jon have never looked this cute or adorable. Nor has Darth Vader, for that matter. Pop Junk Love brings everyone’s favorite characters to huggable life. There's a plushie for every fandom: Check out the Harry Potter OG, Wonder Woman, Pusheen, Moana, and tons more! 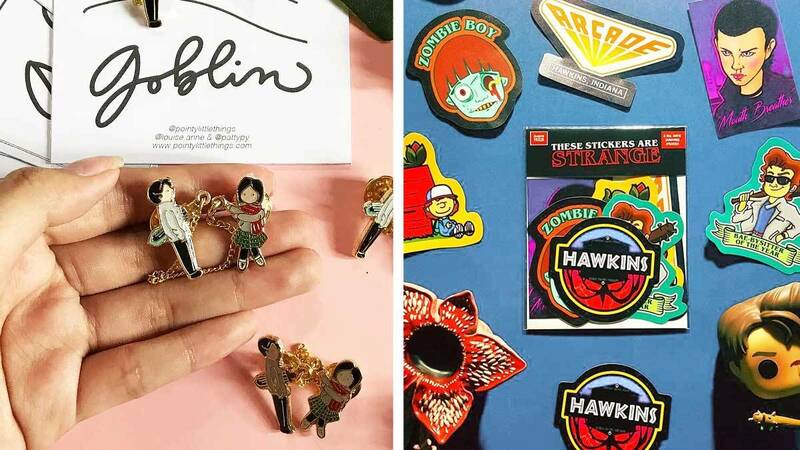 Get a Goblin collar pin for the friend who has Anne Curtis-levels of love for Gong Yoo, or a suuuhhweeeeg enamel Kim Bok Joo pin for the biggest Weightlifting Fairy fan in your life. Your friend can now make like they go to Hogwarts or Camp Half-blood, belong to the Hawkins AV Club, or work full-time at S.T.A.R. Labs. They can even choose which GOT house they belong to, and show some love for their fave Marvel and JL superhero. Find the most kawaii anime stickers and art prints for your otaku friend—including Card Captor Sakura, Sailor Moon, Howl’s Moving Castle’s Sophie, and Princess Mononoke. Whimsicute also has the cutest Stranger Things sticker pack ever! Just when you thought the Hawkins gang couldn’t possibly get any more adorable, they get chibified. There is no fandom Funko doesn’t represent in their extensive catalog: They’ve got Harry Potter, Star Wars, the Disney universe, Riverdale, DC's Justice League, Marvel, Game of Thrones, and so on—basically every toon, TV show, and movie in every universe and multiverse you can think of. Kicks stickers are mostly original designs but there are a few inspired by popular TV shows that would make perfect stocking stuffers for their respective fanpeeps: namely their Weightlifting Fairy and Stranger Things sticker packs. Marcela Suller has stickers and button pins for fans of Ghibli movies, Riverdale, Stranger Things, and even We Bare Bears! And if you have a cat lover pal who’s also into Harry Potter or Star Wars, you’re in luck; she sells fandom-themed cat notebooks, too! Get beautifully detailed watercolor Game of Thrones, The Walking Dead, Riverdale, or Stranger Things stickers and postcards that your friends will definitely geek over from Alissa. Now your friends can wear their fandom on their feet, thanks to Iconic Socks’ cool and fun collaboration with Star Wars, Adventure Time, and Marvel! Get a time-turner for your Potterhead friend, a sling ring for the one who loved Doctor Strange, The One Ring for the LotR fanboy/girl, a Mockingjay pin for the Hunger Games fan, or a Dalek necklace for the Whovian in your squad. More fandom shirts for your fanpeep friends—Harry Potter, Stranger Things, Game of Thrones, LotR—plus accessories like caps, patches, scarves, ties, keychains and necklaces, all guaranteed to get them geeking out like crazy!